Yvonne here with a new Christmas card using a gorgeous Quietfire Design stamp. It'll be Christmas in a couple of weeks (how time flies), so time to get Christmas creative! 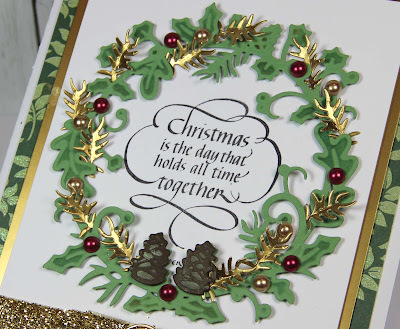 By embellishing with gold accents and Pearls you get that rich Christmas look for your card. Using 3D foam squares lifts up the wreath a bit. 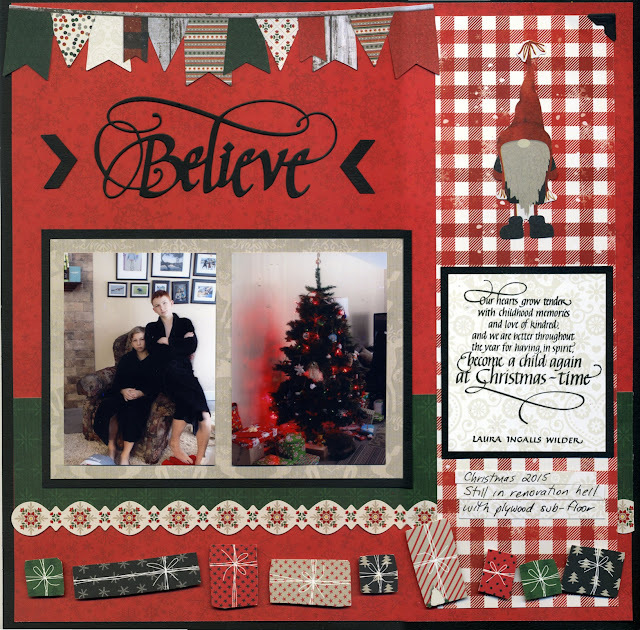 Hi there, Connie Nichol here today with a Christmas layout featuring the Believe Way with Words die and a Quietfire stamp with a most beautiful quote by Laura Ingalls Wilder. My kids are getting older, but even as gawky teenagers, they still adore Christmas and all the special traditions that come with it. I stamped onto a piece of BoBunny patterned paper and then trimmed and matted it to make a page embellishment. Here's the stamp - perfect for so many Christmas themed scrapbook layouts. And of course, the word die 'Believe' is a perfect page title, although I suppose I could have used Merry Christmas! Make sure that you take a few pictures to capture the memories this Christmas, even if it is not ideal! This past Christmas we were still in the middle of renovations and the flooring had all been ripped up. Plywood is not a very conducive environment for Christmas decorating but it is still a special time of year and I'm glad to have these photos to remember it by. Happy scrapbooking! It's a beautiful Monday here on the blog today and i hope that you all had a wonderful weekend and maybe even got a few projects in to do for the holidays. Today i have a box i made for a friend and a matching card. I used the "Always be my friend" set of stamps for the pretty sentiment on the top. I used a burgandy colored ink to match with my rose colored papers and embossed it with clear to make it stand out. 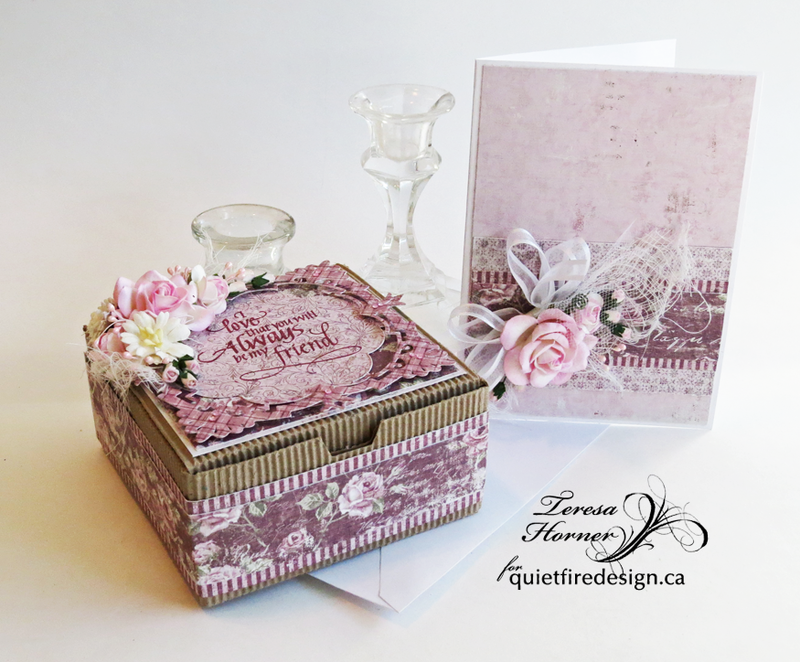 I love to make these fancy little boxes and this one was fun and easy to make. Here is a view from the top so that you can see the gorgeous sentiment. 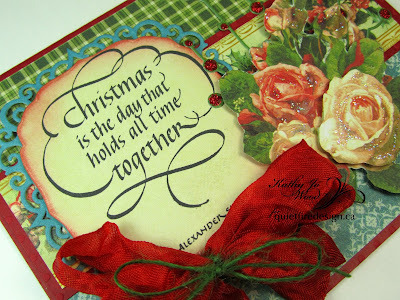 It's timeless and all three of the sentiments are great for cards and projects. Thanks so much for dropping by today! Good Morning Friends. This is Selma Stevenson today. 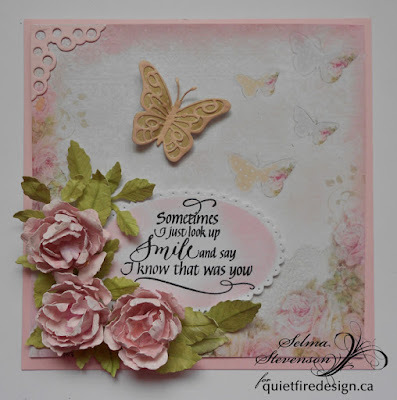 To create my card, I used Suzanne's beautiful new Sometimes I Just Look Up rubber stamp. Just reading this makes you smile, doesn't it! When I first saw this stamp, I imagined creating a card with it that included butterflies. 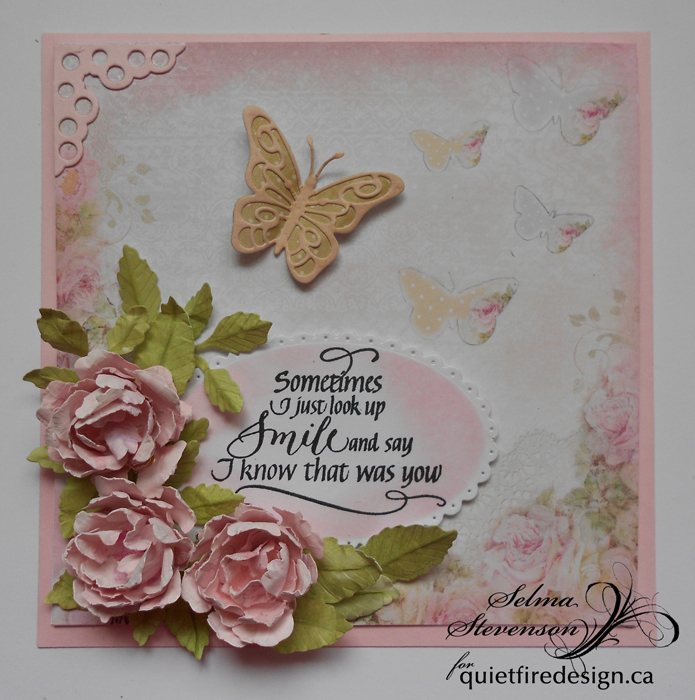 In my stash, I had a piece of design paper with butterflies, and of course flowers, to complete this card. 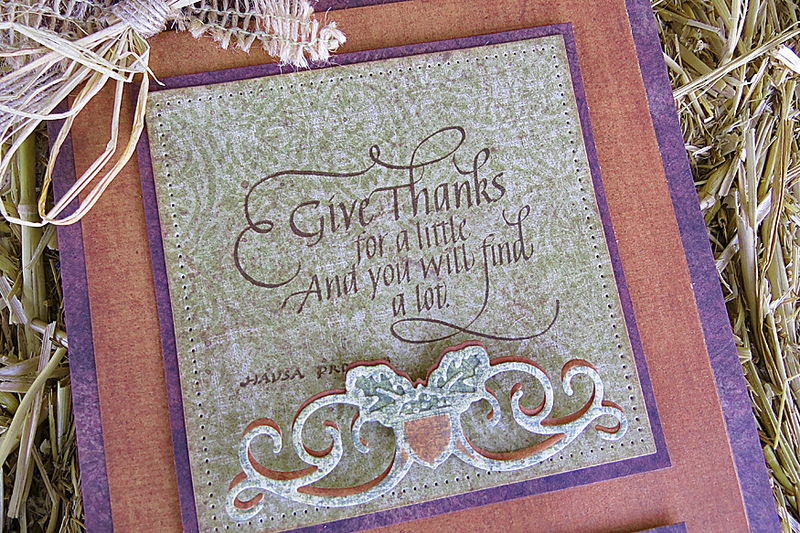 The verse was stamped onto a piece of white card stock, then die cut with a Dotted Scallop Oval die. 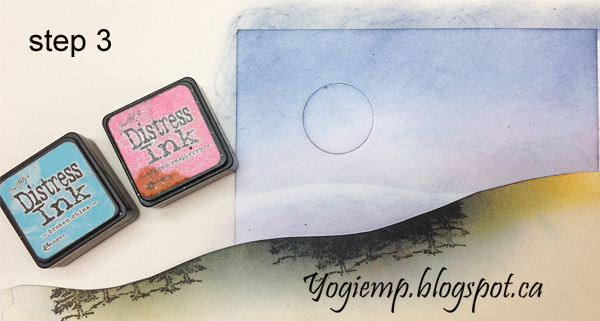 Before removing it from the die, light pink ink was sponged around the edges. To create a dimensional butterfly, the butterfly die from the Els van de Burgt Studio die set Small Butterfly was used. 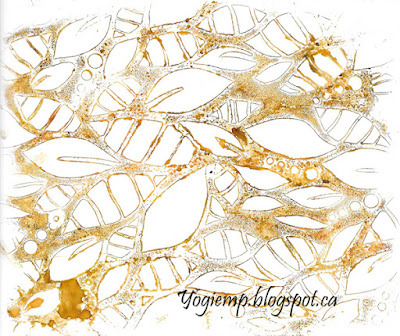 A piece of tan dotted design paper was used for the bottom layer to match one of the butterflies in the design paper. The flowers in the design paper were duplicated by using Susan's Garden Notes Rose die set. The smaller rose petals from this die set were used. To complete the card, one pink corner was die cut and added to the upper left side. Products used from Elizabeth Craft Designs: Dotted Scallop Oval, Small Butterfly, Corners 1, and Garden Notes Rose 1. Stamp the sentiment using black archival ink onto ivory card stock. Die cut sentiment using Spellbinders Labels 47 die. Apply Barn Door Distress Ink along edges. 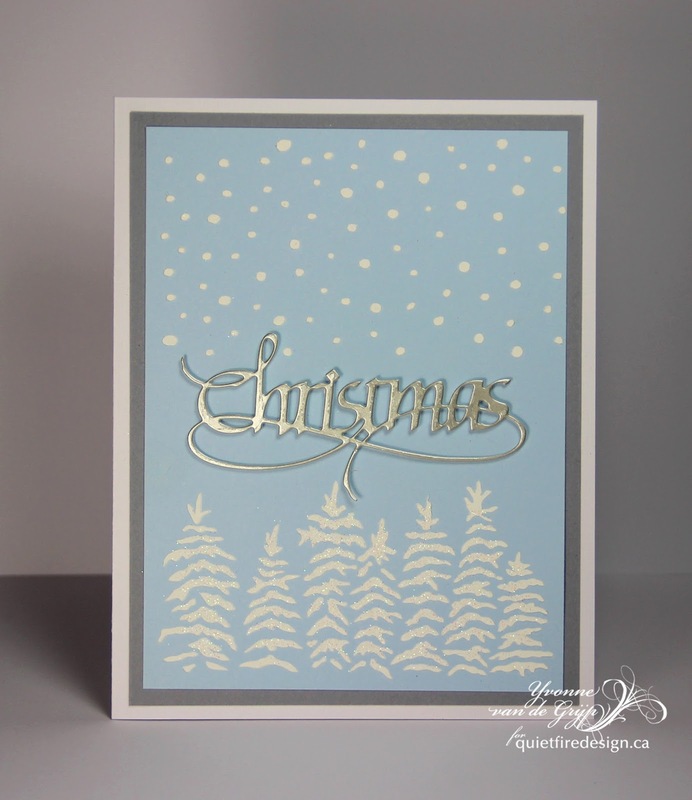 Die cut light blue card stock using Spellbinders Labels 47 Decorative Elements die. Create tent fold 5.5" x 4.25" card using red card stock. Cut Graphic 45 Twelve Days of Christmas papers and layer as shown. Mount both Labels 47 die cuts using double faced foam tape. Die cut Memory Box's Hayden Twigs with green card stock. Assemble as shown and apply red Stickles to berries. Fussy cut roses from Graphic 45 paper and adhere. Apply Stickles (Star Dust) to roses. Dye seam binding using Barn Door Distress Stain. Crunch and create triple bow. Tie together with green twine. Isn't the stamp just gorgeous? Love it!! 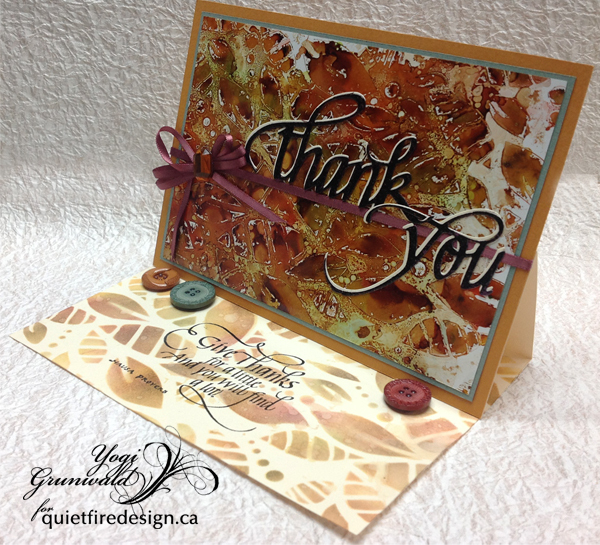 Before I close, I have to mention the awesome Black Friday sale at Quietfire Design. 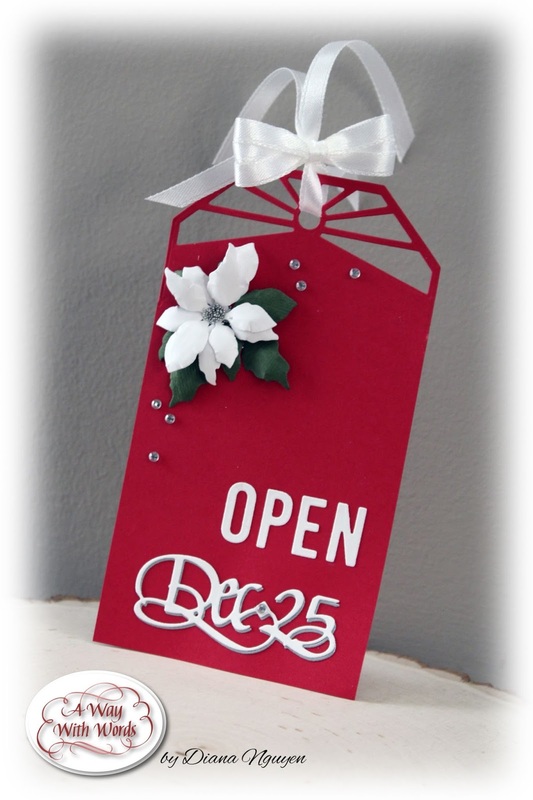 It is a great time to buy goodies for your crafty friends...and yourself! There is a large 50% off section and all stamps are 30% off! Super sweet! Thanks so much for stopping by! Have a happy, crafty day. Scored, and folded my cream toned cardstock to create the easel. 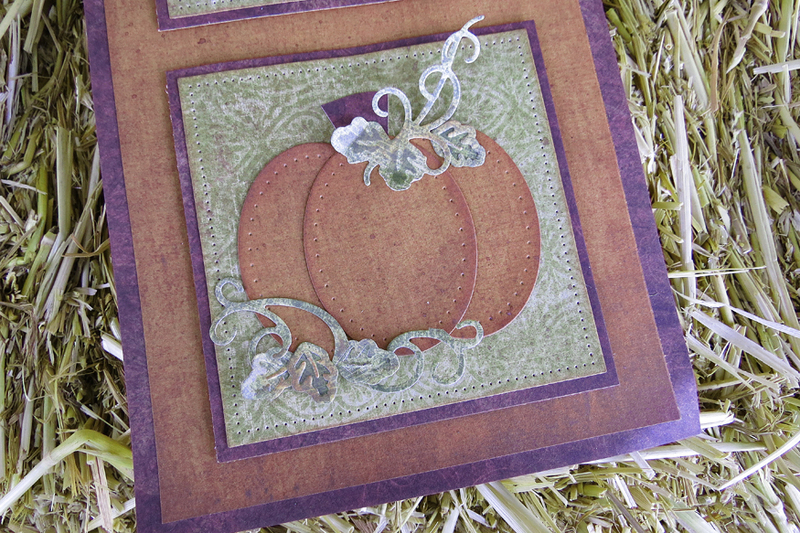 Cut a pumpkin colored cardstock same size as card and adhered to front. Created my alcohol stenciled background using glossy paper I mentioned getting a while back. Taped it to my work surface, then taped the stencil (Pronto "Leaves) down. 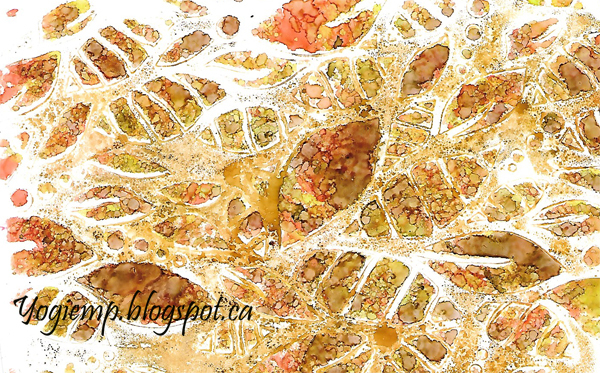 Dropped various colors of alcohol inks (all the yellows and oranges, some Limeade, Pesto and Espresso). There was a lot of wetness and of course it seeped under the stencil - sigh! !, so I removed the stencil and set it aside to dry. Now the stencil had a ton of dried ink on it, so not to waste it I continued playing. See below for the various results. Trimmed it down, adhered to a sage green cardstock, then onto my card front. Adhered a burgundy narrow ribbon and bow, adding an amethyst cabochon to the bow center. 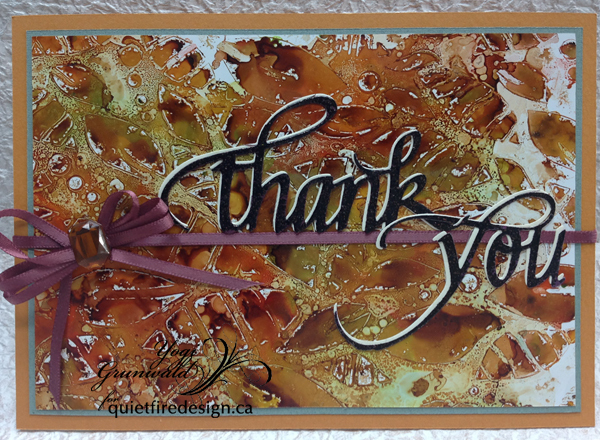 Die cut the "Thank You" from a cream toned cardstock and a dark colored cardstock. Applied Versamark to the dark one and embossed with Emerald Creek "Oil Rubbed Bronze" embossing powder, then adhered both layers together slightly off set, then on to the card front. On the Floor: Used the same stencil and Distress inks, sponged various colors of yellows, oranges, greens and brown. Dried thoroughly. Adhered the 3 buttons to act as my stopper using a glue gun. THE VARIATIONS: (Click on images to enlarge) I applied a generous amount of blending solution to my felt, then swiped it over the glossy paper all over leaving a nice wetness on the paper. IMMEDIATELY flipped it over on to my dirty stencil and pressed down, burnishing the wetness into the stencil to release the dried ink. I started this one the same as above, then pounced with the wet felt, which released the dried up ink from the stencil. Note: my stencil had ink on both sides, so the 1st step was the result on one side of the stencil and the 2nd step was the other side of the stencil. For this one I just used a clean wet felt and and in a cleaning/sweeping kind of motion moved the dried ink off the stencil and onto my glossy paper. As much as I love to receive gifts in bags (so handy!) I still love to wrap up Christmas presents and spruce them up with big fat ribbons and pretty picks. And if you do all that, you need a tag to top it all off! I made this quick one (cause I'm going to need lots of tags!) 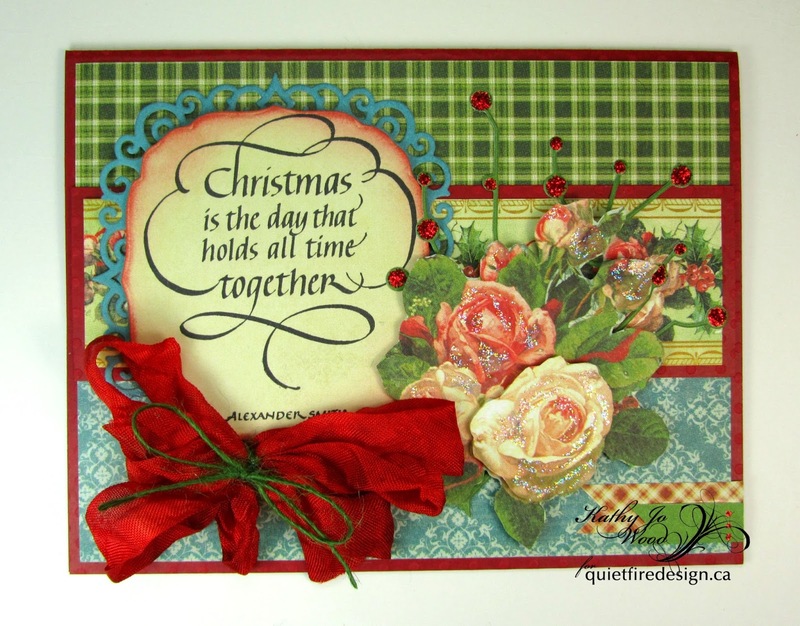 using Quietifre Design Dec.25 Elizabeth Craft Designs Small Poinsettia, Alphabet 1- Caps, and Tags & More 2 - Deco. Once you die-cut everything you need, assembly goes very fast! Oh, as always, I added a silver layer behind the Dec. 25 to make it pop. I also added rhinestones and microbeads to the center of the small poinsettia. I topped it all off with a triple bow using quarter inch ribbons. 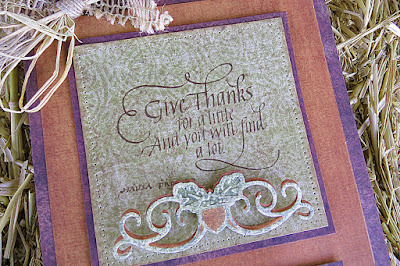 "There is always something to be thankful for"
Stamp the sentiment onto ivory card stock using Jet Black Archival Ink. 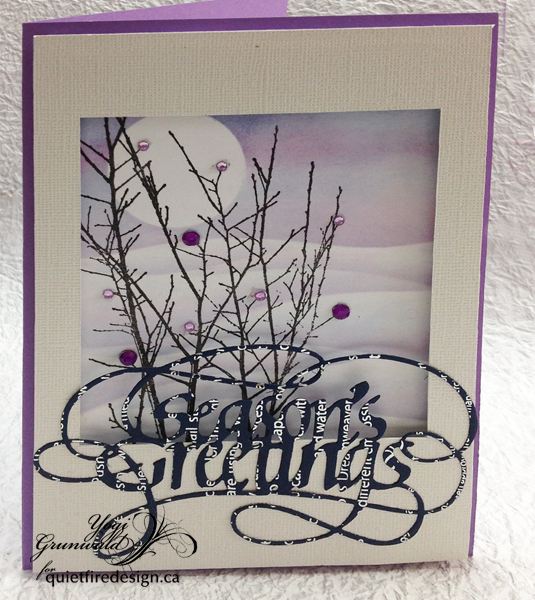 Die cut using die from Spellbinders Fleur de Lis Squares. 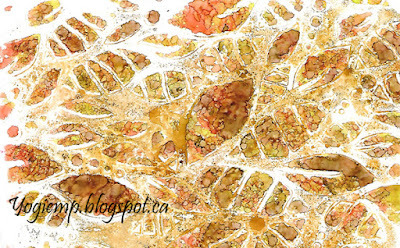 While die cut is still in die, apply Distress Ink in Dried Marigold. 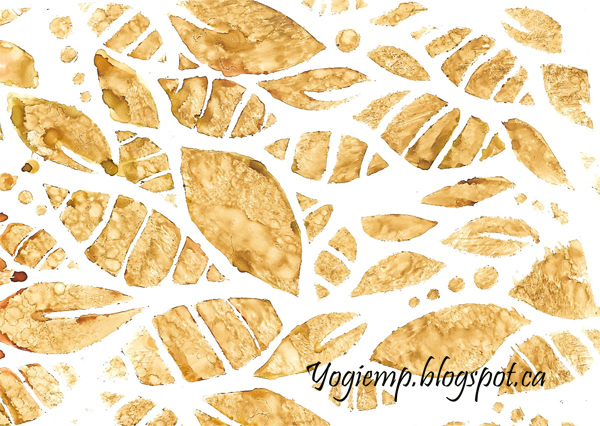 Die cut gold card stock using Spellbinders Victorian Medallion Three die. Create tent fold 5" x 5" card using Kraft card stock. Cut orange and ivory gingham patterned paper from Graphic 45 (6x6 Time to Flourish pad). Cut patterned band and image from Graphic 45's Place in Time patterned papers (8x8 pad). Adhere all layers as shown. Create double bow from gold ribbon. Adhere orange twine ribbon. 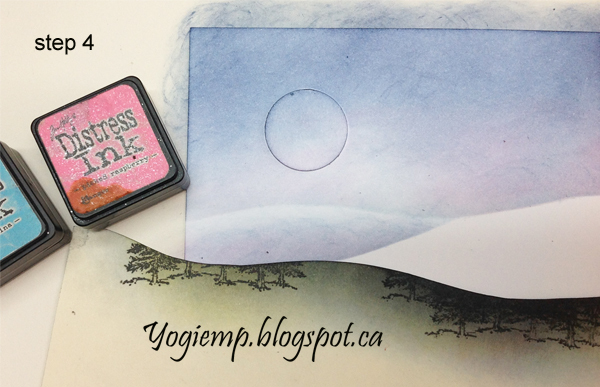 Cut postage stamp (Graphic 45's Place in Time) and adhere using foam tape. Thank you so much for stopping by! I do hope you enjoyed the card. 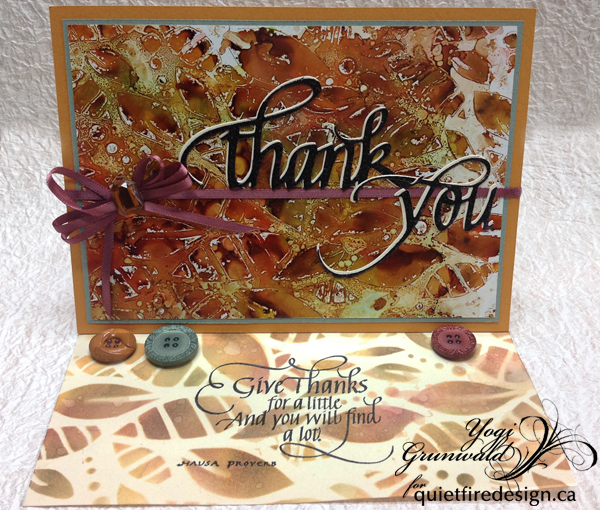 For more beautiful Thanks and Thanksgiving stamps, be sure to check out Quietfire's Thanks-Gratitude stamps. 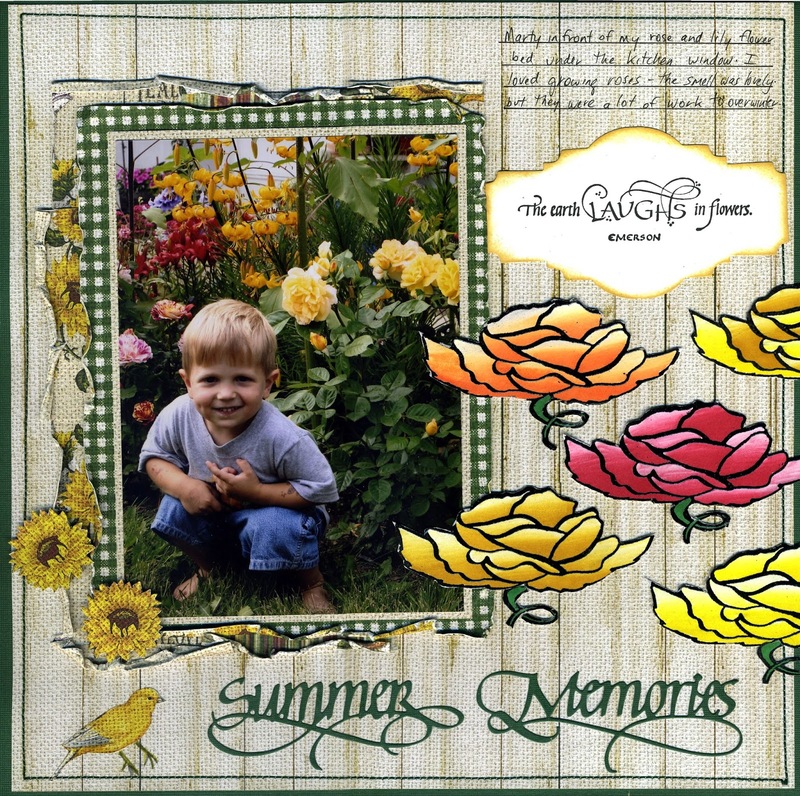 Hello, Connie Nichol here today with a flowery layout featuring The Earth Laughs in Flowers and Rose stamp set from Quietfire Design. In the dark days of November, I like to remember the beautiful colours and fragrances of the summer garden. This is the stamp set I used. I had so much fun with the rose - I stamped it with embossing ink, embossed with black embossing powder, and then coloured with Chameleon alcohol ink markers. 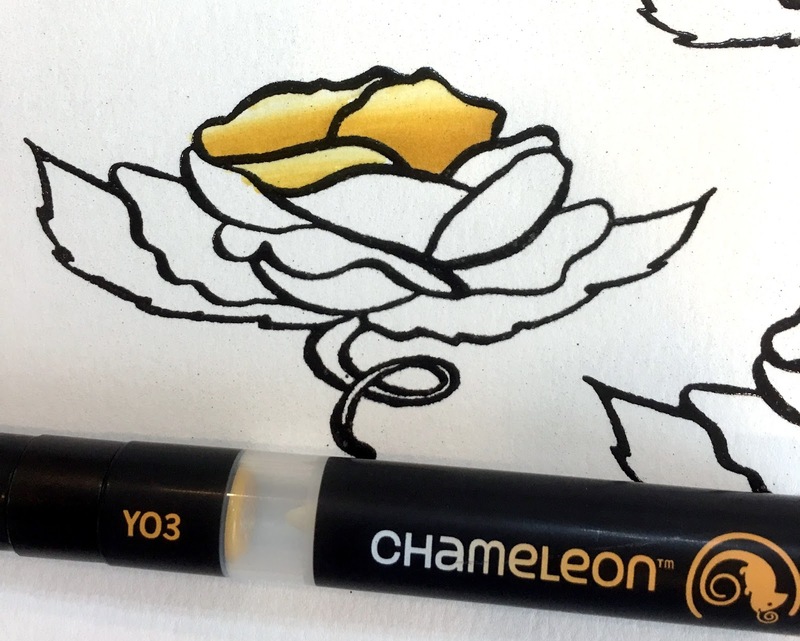 The embossing helps me stay in the lines when I colour. I cut out a handful of these roses and arranged them to highlight the scrapbook page. They are so pretty and you can customize the colour to whatever you want. For the title, I used two of the Way with Words dies and a scrap of green cardstock. So easy! Good morning to all of you and thanks so much for stopping over today. 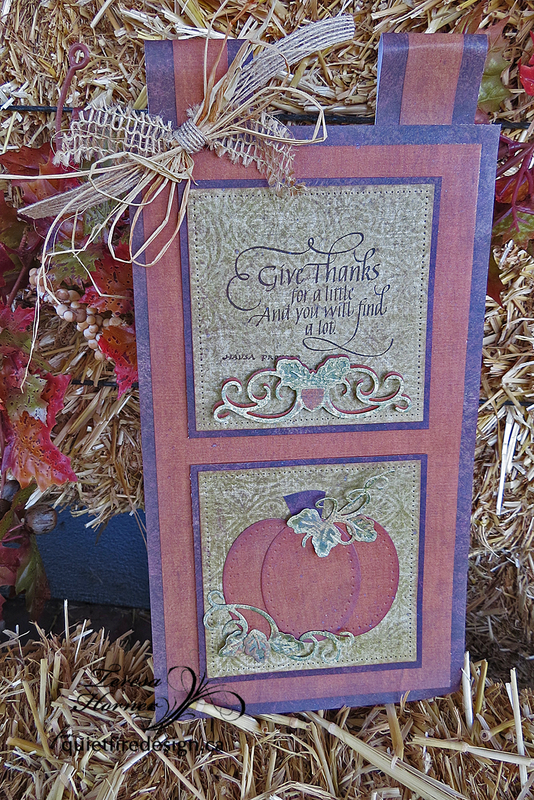 It's been a really nice week of weather here in California and the leaves are changing and dropping from the trees so it's a good time to do all those Thankful cards and projects that you have been wanting to do. actually has 2 stamps in the set. Both are beautiful sentiments and can be used lots of ways. I stamped mine on a piece of printed ivory paper but I think i should have embossed it with dark brown to make it pop more but i still like the vintage ways that it all came out. And the pumpkin i made with oval dies and then used some leaf dies to do the rest. way to decorate for the holidays and fun little things for your kids to make too. Thanks so much for stopping over and have a really good day! 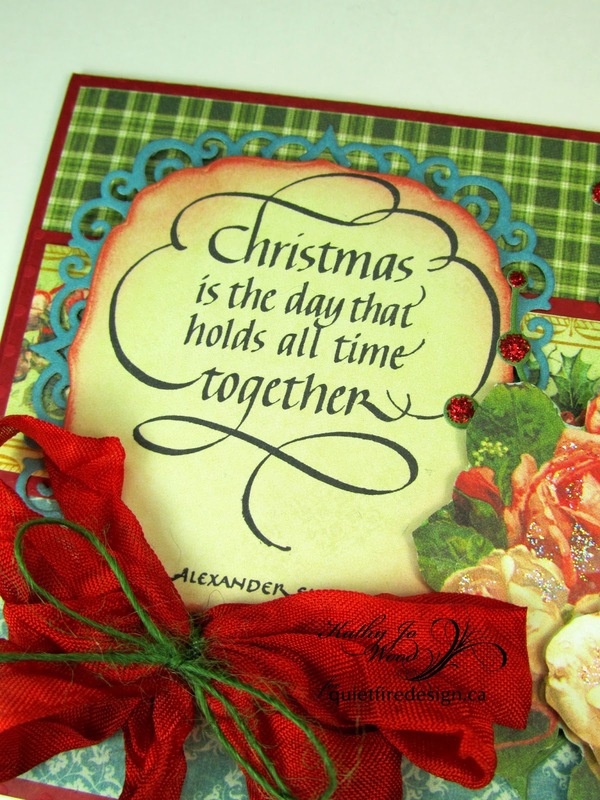 Have you started working on your Christmas card yet? Hello Friends, this is Selma Stevenson today. 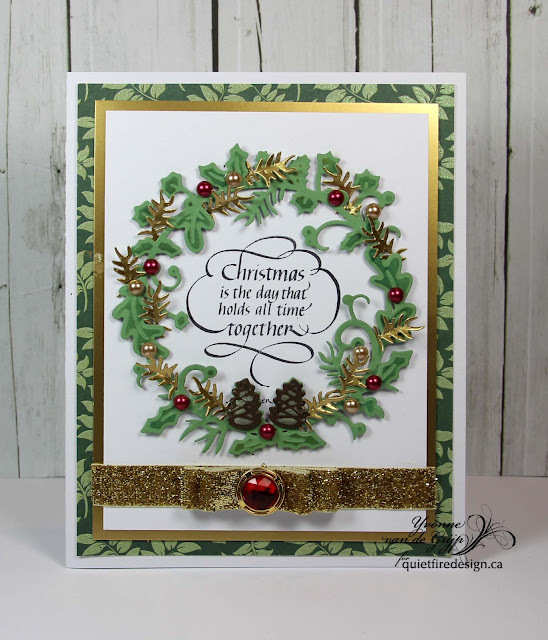 I fell in love with the Joy stamp which is in the Quietfire Creations Flourished Ornament stamp set. Isn't it beautiful! 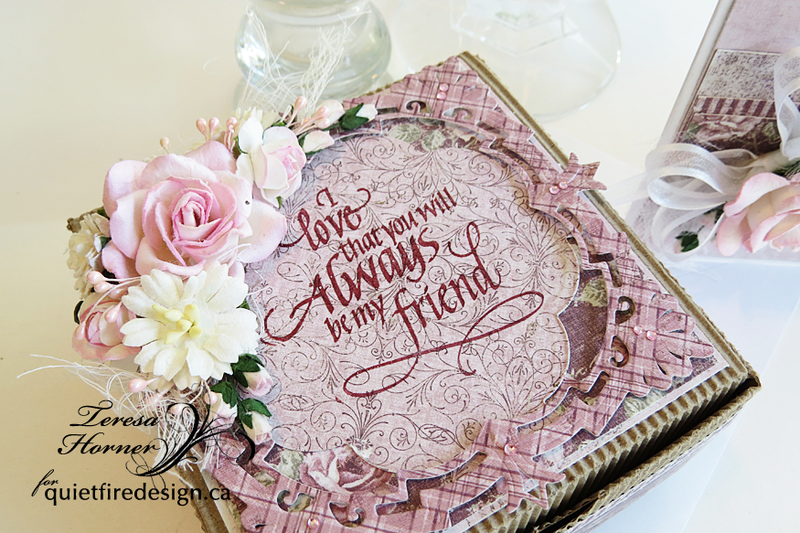 To show off this beautiful stamp, I used the Elizabeth Craft Designs Dotted Scalloped Oval die set and die cut one of each size ovlas. The ovals were layered, using dimensional tape, so that the edge of each die cut matched at the top of the largest oval. These ovals are very dimensional. 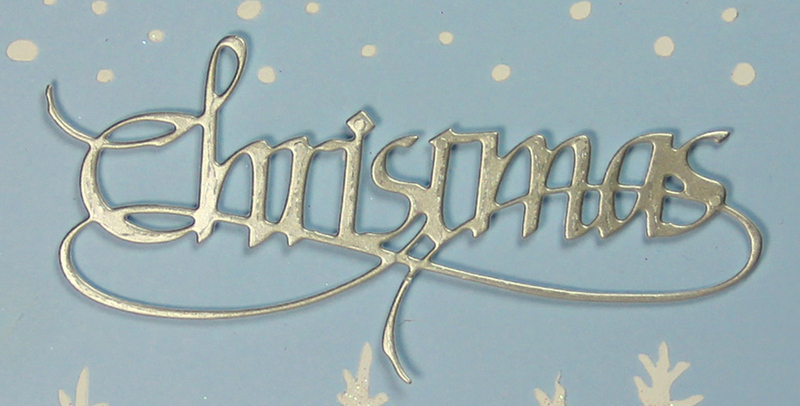 Before attaching the smallest oval, I used VersaMark and Ultra Fine Gold Embossing Power to stamp the sentiment. This oval set was attached in the middle of the card at the upper edge. 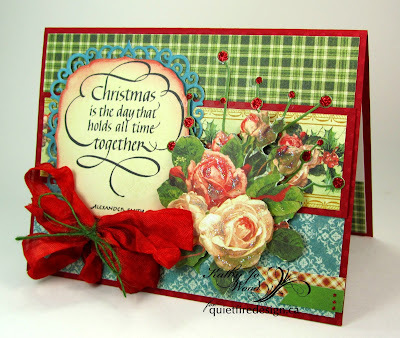 Two flowers were created using Susan's Garden Notes Poinsettia and Garden Notes Small Poinsettia die sets. 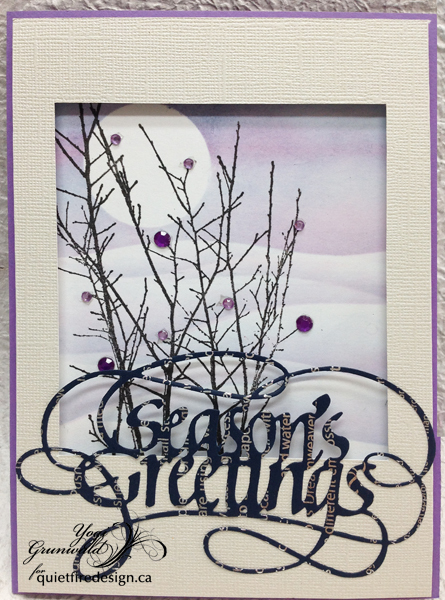 Ten pine boughs were die cut using Susan's Garden Notes Whitepine Boughs & Pinecone die set. The poinsettias were die cut using white card stock and a brush dipped in bright pink reinker, was brushed down the center of each petal. 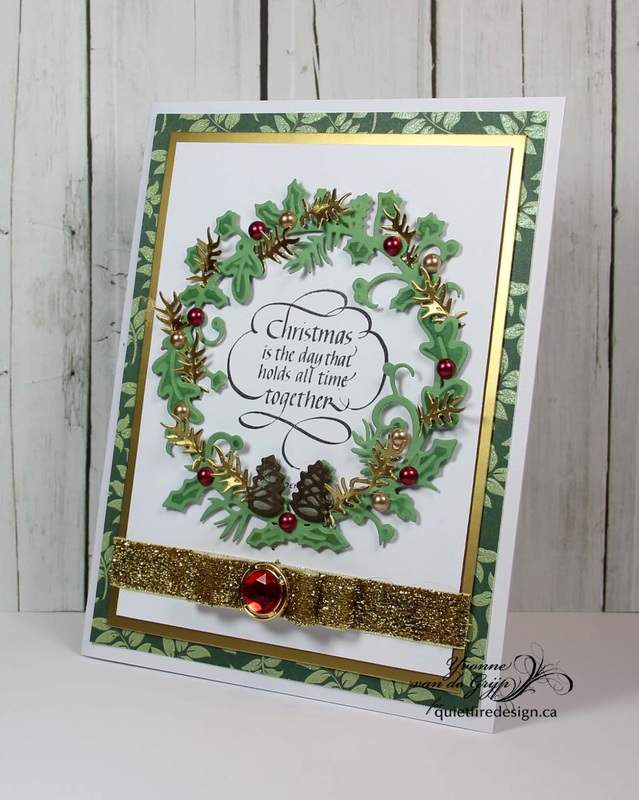 The poinsettias and pine boughs were arranged at the bottom of the oval die cuts. Gold cording and beads were added around the arrangement. The green background was outlined using Elizabeth Craft Design Gold Peel Off Line Stickers. Two Gold Peel Off Sticker Corners were added at the top. There were some gold pieces left when the Gold Corner Stickers were pulled off the sticker sheet. I used a few of these pieces under the sentiment. 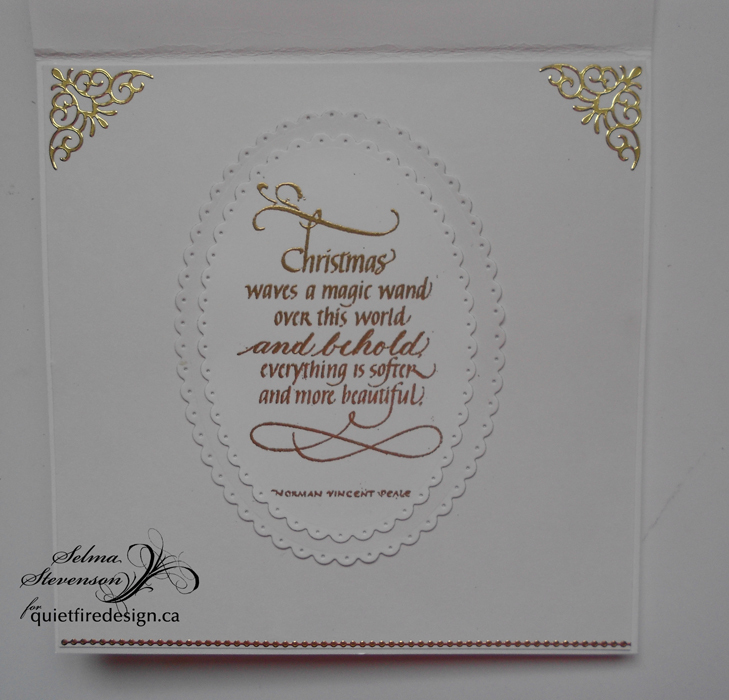 The Quietfire Creations Christmas Waves a Magic Wand stamp is one of my favorite to use on Christmas cards. This sentiment is perfect for anyone. 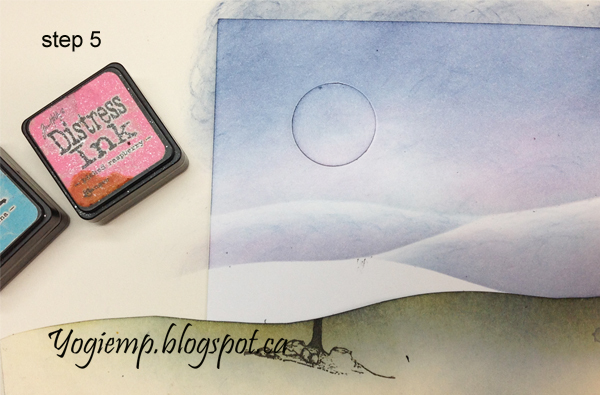 This is the stamp I used for the inside of this card. 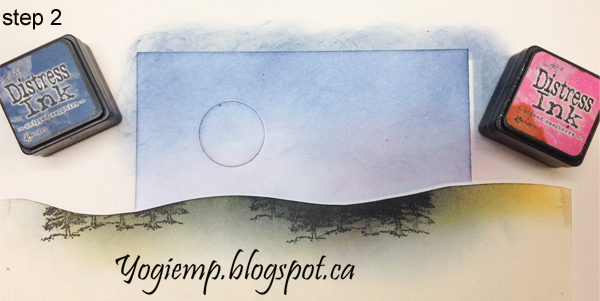 In keeping with the ovals on the front of the card, the two largest Dotted Scallop Ovals were die cut. 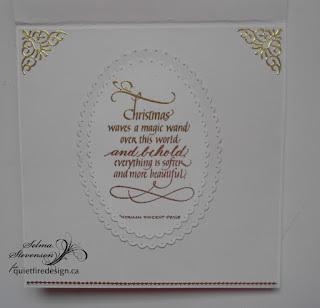 The Christmas Waves a Magic Wand sentiment was stamped using VersaMark ink and embossed with gold embossing powder. I always add an extra piece of card stock to the inside of my cards that is slightly smaller than 6x6 inches. A Gold Peel Off Line Sticker was added to the bottom of the piece. To match the front of the card, two more Gold Peel Off Corner Stickers were added inside. 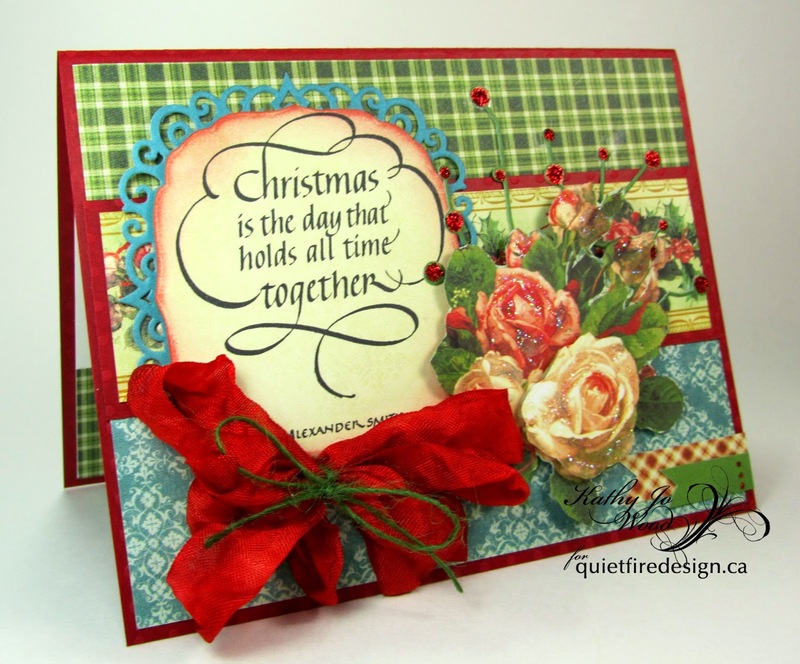 Be sure to go over to the Quietfire Creations Store to find just the perfect stamp or die to create your holiday cards. 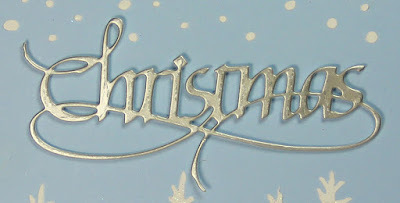 Yvonne here with a CAS (clean and simple) Christmas card using the Quietfire Design/ECD A Way With Words metal cutting die "Merry Christmas 2" (set of 2 dies). The trees and snowflakes were created using ECD stencils and Structure paste. After taking of the stencil (while the structure paste is still moist) I sprinkled on some white glitter for an extra snowy effect. To give an extra 3D effect to the card the die-cut was glued upon the card using little pieces of 3D foam tape. Scored, and folded my purple card (5"w x 7"h). 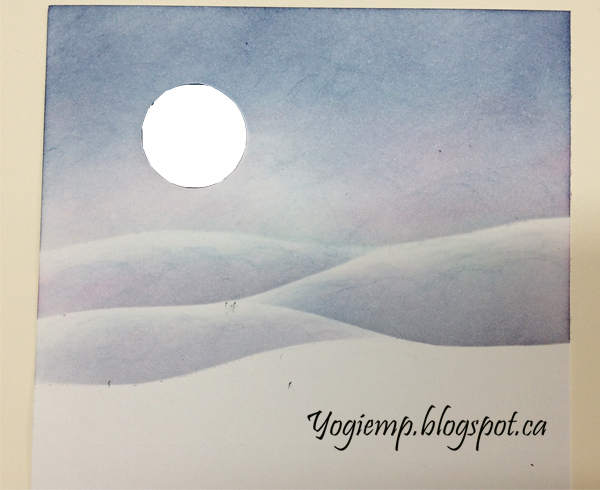 Created the Snowy Hills (see step by step pics below). Trimmed down, stamped the bare branches (Penny Black) using Versafine Black Onyx and clear embossed, then adhered to card front. 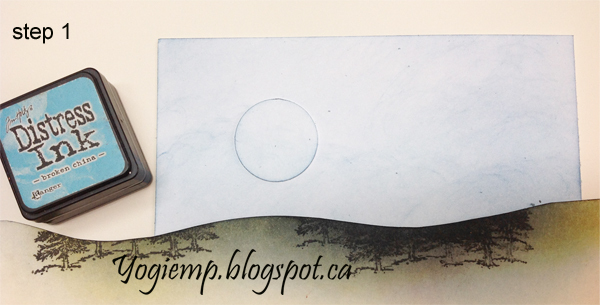 Cut a piece of white pearlized textured cardstock, slightly smaller than my card base. Cut a window and adhered to card front with 3D foam tape. Adhered a bunch of mauve and purple rhinestones. You may recognize the cardstock I used to die cut the "Season's Greetings" - packaging from Dream Weaver stencils...Adhered to frame. Punched a 1" circle to create my moon mask. Adhered to my 5"w x 7"h cardstock with removable tape. Cut a wavy piece of cardstock to act as my mask for the hills.Sponged all over the upper area with "Broken China". Please note: I use dirty sponges so my colors are not true. The blue sponge has various other blues mixed in giving a unique color. Then went in with "Chipped Sapphire" in the upper sky area. and some "Picked Raspberry" near the hills. Moved the hill mask down and sponged with the broken china and picked raspberry, leaving a white are near the top of the hill. Continue moving the stencil, flipping it or whatever to get the hilly look you want. Continue to the bottom of your cardstock or as far as you want to go. When done, remove the punched moon. Stamp with a pleasing image.